Isn’t that a gorgeous cover? As soon as I saw it and felt the springtime temps here is Wisconsin I knew I had to escape right into this book. Elliana Allbright is the owner of Scents & Nonsense where she sells items made with special oils she distills from plants in her own garden. The Enchanted Garden is right next to shop and abuts right up to her tiny house. The garden is a relaxing place with spots for people to sit and wind down from the stress in their lives. Ellie may be able to whip up the perfect perfume to ease whatever malady they may be feeling. Ellie’s dog, Dash and shop cat, Nabokov have free rein of the area so they may dish out their own kind of comfort too. In this installment, Ellie’s tiny home, formerly a garden shed, has gathered some acclaim and a national magazine is sending a reporter and photographer to include her home in an article about the tiny house craze. Ellie bumps into the journalist while she is out having dinner with her brother and his girlfriend. She wasn’t that impressed with the man but tried to be friendly so that his story about her wouldn’t do more harm than good. When she learns the next day he was found dead in his hotel room and that her brother’s girlfriend is the prime suspect she knows she has to dig up the real killer and fast. She has witnessed how the lead detective investigates, in that he doesn’t. She hopes she can persuade his partner and her friend, Detective Lupe Garcia, to work together to solve this case and clear up the whole bloomin’ mess. The way this author sets the scene is absolutely magical. You can practically smell the flowers blooming in the Ellie’s garden, feel enveloped by a fog that rolls in, and pick a book off the shelf curl up in the chair in Ellie’s living space. It is a place I would love to visit. I have even given serious thought about living in a tiny house myself. That would be fine until the kids and the grandkids want to visit 🙂 then I don’t know what I would do. We meet some very interesting characters this time and we travel to a very intriguing place. The reporter that was killed has ties to Poppyville and Ellie is going to shake that family tree to see what seeds drop out. This leads her down a very surprising path of twists and secrets. Readers will feel like they are on her shoulder as she does her best to distill the real criminal. It was not an easy task and at first there were many more questions than answers. This story is so well written and the characters are very engaging. The themes are current and relevant. There is just a hint of magic and humor pops up in all the right places. Bailey Cattrell has treated us all to an enchanting mystery. 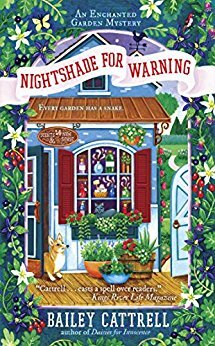 Gardens and pets fascinate me, so I know I would enjoy reading this book. Looks like another terrific mystery I would love to read. Thanks for your generosity. Love the pretty cover! Wish I had some of her magical perfumes for when I get my headaches and for my other health issues. The book sounds very exciting, Elle she’ll get the killer! The tiny houses look neat but not very much room, wouldn’t work for me either when the sons and grandkids come a visiting. Sounds interesting – will definitely be looking for this series!